When wedding planning begins, the venue, photographer and caterer are usually the first three vendors booked for a wedding day. The one most often left to the end, depending on budget, is the videographer but we think they are worth adding to your must-have list. Here are our top 5 reasons you should hire a videographer. 1. Through video, videographers create a time capsule of your day, preserving the laughter, sentiments and pure joy shared between family and friends. We all know weddings can be a blur. You can’t be everywhere at once and there are some moments you wish you could play on repeat forever. Witnessing over and over again, the instant reaction of your partner as you see each other for the first time. Yes, pictures capture a lot but they cannot capture the sounds of those you love. Toasts, laughter, happy tears and sweet nothings are sometimes the smallest but most valuable moments between you and those you love and it can only be preserved on video. 2. Video has a way of helping you remember all the little details of your day. Let’s start with your vows. Sure, you may have them written down but the flection in voices, the reciting through tears, the inside joke that was said on a whim or the giggle of the audience. Video can save it all. Music on your wedding day plays a big role. Looking back 15 years from your day on video, you’ll be able to remember what songs you danced to. For example, what was the song that got everyone on the dance floor? What song did you dance to with your dad? Sometimes the best moments are unscripted. Videographers take a lot of behind-the-scenes footage. 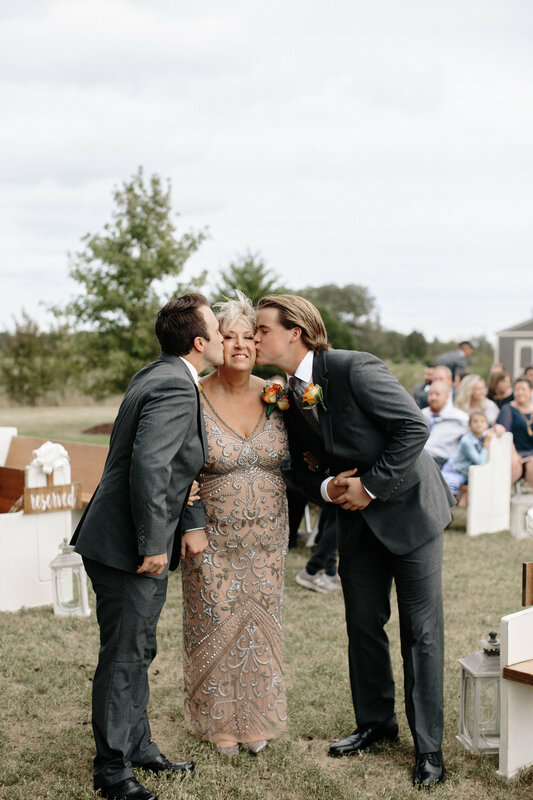 The goofy moments during bridal pictures, the choreographed dance of the groom and his mother, the impromptu blessing from a grandmother can all be caught on film. All the moments that can be missed by the couple or forgotten in the hurry of the day. It’s a great way to preserve the smallest but best memories of your wedding day. The big picture often takes a backseat to the pretty details but they are part of the experience too. Weather and venue surroundings, for example. Was it pouring or the most perfect day? Did you dance under a sunset or dodge raindrops to get to the reception? Details of your venue will fade but with video, your dressing room or footage of your ceremony area, quiet and still before guests arrive, is forever on film. 3. With today’s editing, your video tells your story. Unlike years ago (like when I got married) wedding videography is not just hours of footage of your wedding day. Videographers edit the hours of footage and tell your love story in a manageable 10 minutes or so. They add in readings of letters, reciting of memories and record the love story that got you to this day. Having the chance to look back on that as the years fly by, to remind you of the why in the darker days or to share with your kids years from now is priceless; it’s a true gift and is worth so much more than the fee they charge! 4. With a click of a link, those that can’t be at your wedding will feel like they were. With the power of technology, combined with the editing styles of today, guests that couldn’t be at your wedding will feel like they were with the sharing of a link! What better way to relive your day again and again than to share it with those you love, near and far. It’s truly one of the few details of your day that can be shared for years to come, with as many as you want to see it. 5. You will regret it, if you don’t hire a videographer! Take it from a girl who did not book a videographer. My justification was “no one wants to watch six hours of footage from my wedding day”. I never thought to consider my older self or my kids. Sixteen years later, I have no footage of our wedding day. Oh how I would love to look back to watch our first dance, see video of my stepfather, husband’s grandmother, my cousin and so many more that are no longer with us. I also think it would be fun to see how much we’ve changed and to reflect on the styles of the early 2000s. Most of all, I regret that I can’t let my kids get a glimpse of mom and dad before we were parents. Trust me when I say, that $800 to $1000 you may spend on a videographer will be a purchase you will treasure for years to come. So will your parents, your kids and possibly even your grandkids. They are not as expensive as you think. Do your research, there are some very reasonable, high quality videographers available. They work so well with photographers to capture the whole day. You will get the beautiful posed pictures and video of the moments in the making. It’s a win-win vendor partnership. With many, you get to pick the music for your video, making even final product reflect your love. Most deliver your final product in a beautiful package to forever treasure. Like photographers, videographers have their own editing style. Be sure to do your homework to find the style that works for you. Lost on where to look? Ask your photographer or venue for suggestions. Need tips on how to differentiate editing styles, check out this blog post for help. Here are two of our favorites and some of the videos they created for our couples. Both Doug and Connor are now booking for 2019 and 2020 weddings. Doug Cochran of Douglas Ray Productions. iamdouglasray.com. Doug can create any style video you want, including with or without audio, music of your choice and various lengths. Conner Price Videography. Check out more about Connor on his Facebook page or his Vimeo page. You will see that Connor can also create videos to bring out your personality, suit the style of your wedding and music preferences. Tell us are your thoughts on hiring a videographer for your wedding? Are you 100% in or still on the fence?